It's still just a beginning….but I think I'm hooked. The process. The materials. Not to mention the wine, and the good music in the background, and the time with two people I love to be with. More pictures when I have a little more to show for myself…. 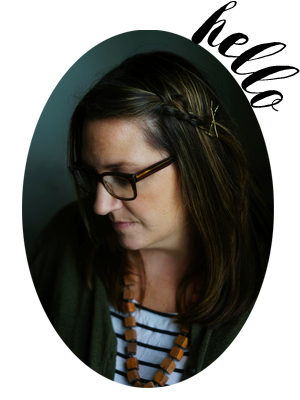 I used to weave before I had children, and I loved every minute of it. 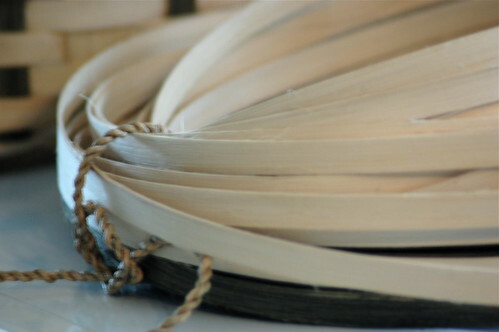 I’m about to take a refresher willow weaving class and I can’t wait. I’m glad you’re enjoying it too. Such a hugely satisfying pastime. I would love to learn to weave. Of course, I would also like to learn to spin and a whole host of other things. I am not sure I have time for any more hobbies either. I am glad though that you took the time to pursue it. Your project looks great. it is so satisfying. it’s a bit like knitting–the weaving, watching tension, sort of methodical. i’m really enjoying it. 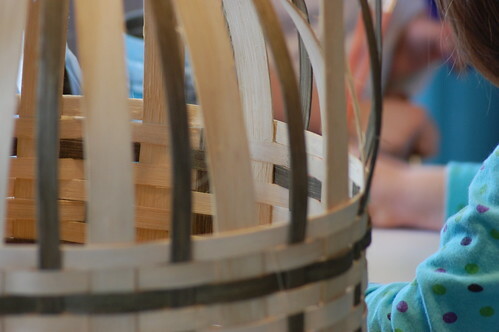 I’ve been wanting to weave baskets since we took a family trip to the YMCA of the Rockies and I walked through the arts and crafts center– it was basket weaving heaven. I have plans for a mama only getaway this spring or summer to sit in that place, look out the gigantic windows at the pristine mountains, and weave myself a basket or two. My mom and I took a class in this when I was about 10. What good memories. I have not done in so long, but I know my girls will love it when they are bigger! baskets!! don’t feel bad–it’s so useful; think of all the new storage you will have for all your other hobbies 🙂 I took a basketweaving camp class one summer in middle school. my friends and I were old enough to feel ironic about it and did it as a joke (aren’t all middle schoolers ironic? ), but I still have and use several of my creations. Oh basketry! I loved it when I did some in highschool and junior high with my 4-H club. Miss it. Wonderful warm weather, on the lawn with friends activity. I think I need basket-weaving friends too. Will have to get on that. I never knew that weaving your own baskets was so achievable, thanks for the inspiration!